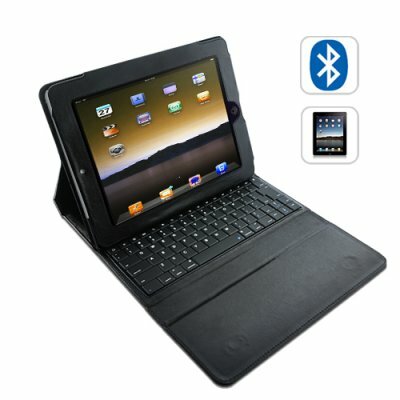 Successfully Added iPad Leather Case Holder with Wireless Keyboard (Black) to your Shopping Cart. If you own an iPad then this is the absolute must-have iPad accessory for you. What makes this iPad keyboard case so special? Well, for starters it’s stylishly designed from all-black hand-made leatherette. It effectively protects your iPad from damage due to scratches or accidental drops. And it features a fully loaded Bluetooth wireless keyboard that is comfortable enough for all day use. How does it work? It’s simple- just slide your iPad into the case, turn ON the wireless keyboard, sync your iPad to the Bluetooth keyboard and begin typing away! The full QWERTY keyboard provides all of the essential keys you would find on a laptop, and also provides additional shortcut keys to quickly launch applications, adjust screen brightness, sound and more. If you are looking for a stylish iPad case with an easy to use wireless keyboard- then it doesn’t get better than the A80. Take advantage of our factory direct pricing and order the A80 in bulk to generate some nice profit on a sure shot best seller. Buy yours now though because at this price the A80 is expected to go fast. While we can not guarantee compatibility, users have reported successfully connecting their Android and Windows devices to this device via Bluetooth.